Jet Set Smart: CANADA AND WINE- A PERFECT WINTER COMBO! CANADA AND WINE- A PERFECT WINTER COMBO! The Niagara Wine Country in upstate New York and Canada has a lot of great wineries. In the town of Niagara-On-The-Lake, Canada alone- there are over 20 wineries. One of the best wines they produce in that region is Ice Wine- a sweet, syrupy delicious wine that's best alone, with cheese or dessert. While most people think of checking out wineries when it's sunny and warm outside, this is the time of year when Ice wine grapes are at their finest. Winter can feel like forever, so a short weekend getaway is a great way to break up my least favorite season. I was just in Niagara and Toronto, Canada this past September for my big 3-0 and I have to say it was awesome! If you haven't been, definitely look into it and see if you can check it out. 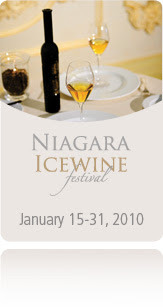 Your perfect excuse for planning a weekend to go there...The Niagara Wine Festival 2010! The festival runs this month from January 15th-31st. There are a lot of great events planned for the festival from wine tastings, to food tastings and celebrations of all kinds. Yes, it's certainly cold up there this time of year, probably not the place to go to with kids, but it's a good excuse to jet set on the cheap with friends or your honey. The price for flights and hotel rooms this time of year is low. It's also a great way to be introduced to some new wines you may have never tried before...California isn't the only place that makes wines my jet setters! Nice blog. Glad to know about the Niagara Wine Festival 2010! Being a wine lover, wish If I could make it to the fest. Thanks for the info. Thanks Hampers! Glad you like the blog. I am a wine lover too and wish I could make it to the festival this year, but I think I might have to wait until next year. NEW YORK PIZZA SNOB NO MORE! GIADA COOKS UP A BULLSEYE FOR TARGET! PUT YOUR PAWS TOGETHER FOR KIMPTON HOTELS!